Disclaimer: This tutorial is for educational purpose only. Hacking Wi-Fi passwords may be illegal in your part of the world. One of the many queries we get from our readers is how to hack Wi-Fi password. Though there are many ways to hack Wi-Fi, today we are going to show you how to hack any WiFi password using Wifiphisher. The beauty of Wifiphisher is that it can hack WPA/WPA2 protected Wi-Fi networks without cracking. Without much ado, here is how you should go about how to hack Wi-Fi password without cracking using Wifiphisher. Read the disclaimer above and proceed at your own risk. Wifiphisher is a security tool that mounts automated phishing attacks against WiFi networks in order to obtain secret passphrases that people use to lack their Wi-Fi networks. Basically, it is a social engineering tool unlike other methods which use brute force attacks. Wifiphisher presents a very easy way of obtaining WPA/WPA2 protected secret passwords. WiFiphisher creates an evil twin AP, then de-authenticate or DoS the user from their real AP. The Wi-Fi user logs in to find the Wi-Fi needs re-authentication and that is where Wifiphisher works great. The Wifiphisher redirects the Wi-Fi user to fake AP with the same SSID. After connecting with fake AP, the owner of the Wi-Fi network will see a legitimate looking webpage that requests him/her to input password to “Upgrade firmware.” When the user enters the password in the cloned web page, it is reported back to the hacker without the knowledge of the Wi-Fi user. User allowed further to access the internet from fake evil twin AP, so they can’t feel anything suspicious. The Wi-Fi owner goes about surfing the internet obvious to the fact that you have hacked his/her Wi-Fi password using Wifiphisher. After installing python, you have to unpack the Wifiphisher. Navigate to the directory where Wifiphisher has been installed.To navigate type below command in terminal. To run script type below commands in terminal and hit enter. Once installed the first time you run the script, it will likely tell you that “hostapd” is not found and will prompt you to install it. Install by typing “y” for yes. It will then proceed to install hostapd. When it has completed, once again, execute the Wifiphisher script. This time, it will start the web server on port 8080 and 443, then go about and discover the available Wi-Fi networks. Wifiphisher will get to work and list all the Wi-Fi networks it has discovered. From the listed Wi-Fi networks, select your target AP. To select target just press ctrl+c (to stop scanning) and type “num” of AP. After entering num hit enter. The Wifiphisher will show you the target APs SSID and Mac address. Now let the Wifiphisher do its magic and clone this SSID while jamming the real AP. Once this process is completed, the Wifiphisher will direct the original owner of the Wi-Fi network to the cloned page and ask them to re-authenticate their login credentials. After connecting to evil twin AP, Wifiphisher serves a legitimate looking proxy 10.0.0.58 web page and display a message to the Wi-Fi owner that his/her firmware is being upgraded and they should enter their username and passphrase. When the user enters their password, it will be passed to you through the Wifiphisher open terminal. Thus Wifiphisher does its job without cracking or even letting the Wi-Fi user know he/she has been hacked. Just when we thought we have had enough of worries on our plate, such as ransomware, data theft, DDoS (denial of service attacks), a joint study done by two researchers last month has revealed that alien civilization could destroy the Earth with just AI (artificial intelligence) messages and that too without visiting us. The academic paper titled “Interstellar Communication. IX. Message decontamination is impossible” has been written by Michael Hippke of the Sonneberg Observatory in Germany and John Learned of the University of Hawaii. The paper discusses about a possible alien invasion either intentionally or unintentionally, by embedding code in a message. “It is cheaper for an extraterrestrial intelligence (ETI) to send a malicious message to eradicate humans compared to sending battleships,” the researchers wrote. They claim that such a message would be impossible to decode and could pose an “existential threat,” hence, humans should use extreme caution to open up the message. “A complex message from space may require the use of computers to display, analyze and understand. Such a message cannot be decontaminated with certainty, and technical risks remain which can pose an existential threat. Complex messages would need to be destroyed in the risk averse case,” the researchers added. The researchers explain that if we do receive messages that appear ‘positive and interesting’, it would probably be better to have them printed rather than try and open it on a computer, as any kind of advanced malware message could destroy the technologies on our planet and completely shut them down. They suggest that the messages we send to the aliens need to be carefully considered. “As we realize that some message types are potentially dangerous, we can adapt our own peaceful transmissions accordingly,” the researchers write. “We should certainly not transmit any code. While the good news is that the threat of a malicious contact is extremely low but it is not zero, the researchers claim. “It is always wise to understand the risks and chances beforehand, and make a conscious choice for, or against it, rather than blindly following a random path. “Overall, we believe that the risk is very small (but not zero), and the potential benefit very large, so that we strongly encourage to read an incoming message,” the researchers say. The self-driving car, which is considered to the future of transportation, was involved in a fatal vehicle accident that killed one pedestrian woman. An Uber self-driving car in Arizona was involved in a crash that killed a woman crossing the street early on Monday, ABC15 reported, making it the first fatality involving an autonomous vehicle in the U.S. The Tempe police said in a statement that the self-driving car was in autonomous mode when the vehicle struck 49-year-old Elaine Herzberg while she was walking outside of a crosswalk. Herzberg was taken to a hospital where she later died of her injuries. “The pedestrian was outside of the crosswalk. As soon as she walked into the lane of traffic she was struck,” Tempe Police Sergeant Ronald Elcock told reporters during a news conference. While the vehicle was moving around 40 miles per hour when it struck Herzberg reveal the preliminary investigation, it is not yet known how close Herzberg was to the vehicle when she stepped into the lane, he added. Elcock also said he believed Herzberg may have been homeless. Chief of police Sylvia Moir told the San Francisco Chronicle on Monday that video footage taken from cameras fitted to the autonomous Volvo SUV potentially indicate that Uber is not at fault and the victim is more likely to be blamed for the incident. “It’s very clear it would have been difficult to avoid this collision in any kind of mode [autonomous or human-driven] based on how she came from the shadows right into the roadway,” Moir told the paper, adding that the incident took place roughly 100 yards from a crosswalk. “It is dangerous to cross roadways in the evening hour when well-illuminated managed crosswalks are available,” she said. Although the vehicle was operating in autonomous mode, a driver was present in the front seat. But Moir said there appears to be little he could have done to intervene before the crash. Following the incident, Uber said it has suspended North American tests of its self-driving vehicles, which are currently going on in Arizona, Pittsburgh and Toronto. Uber said in a statement on Twitter: “Our hearts go out to the victim’s family. We are fully cooperating with local authorities in their investigation of this incident.” However, a spokesman refused to comment further on the crash. The incident is currently being investigated by Tempe authorities and federal officials. Canada’s transportation ministry in Ontario, where Uber conducts testing, also said it was reviewing the accident. Video footage will help the ongoing investigation, and the case would be submitted to the district attorney, Elcock said. The latest incident is a prime example that self-driving technology is still in its early stage of development and hence, self-driving cars are not yet ready for our roads. University has never been a breeze. Studying hard and balancing that against what is often a newfound experience of freedom, can take a lot of practice to figure out, and even then many of us don’t manage to master it by the time we leave. Luckily for us, we live in an age where our advanced technology allows us many advantages that simply were not viable to classes of the past. In this article, we’ll go over just a few of the smart tech which can help create the difference between success and failure, making your life easier in the process. A modern piece of technology which no student should be without if they can help it. Any piece of sufficiently advanced mobile equipment will work here, whether a phone, tablet or laptop. This helps not only in being able to easily check online for updates but in allowing the quick research of anything which comes up in real time. This is something our parents would have killed for, so make the most of it. Many of us perform searches on the web every day, but many of us only know the most basic facets of this type of information gathering. Learning a few extra search commands, also known as “search operators”, to use on Google can massively increase the efficacy of your searches, and finding the right searches on which to search can also create a world of difference in usable results. Most commonly, at least on our end, we found the – command especially helpful for Google. This can be used to simply remove any results with the word following the -. A little thing, but one which can make all the difference, and this is only one of many possible options. Another good bet, especially when you’re really stuck, is taking advantage of the already existing homework market to get an idea of the correct answer. There are websites out there which can help with direct questions, for those without the time to mess around. Finally, be sure to check out websites dedicated to academic article searches, like Google Scholar. These are a godsend when it comes to proper citations, not only in terms of actually counting as real citations but in terms of also generating the exact citation for you, so you don’t have to bother with the constant hassle. Despite being a form of technology that is so widely used by so many people, there are some who would rather avoid having their personal information online. While this is something we can absolutely agree with this, there are issues when it comes to group work that becomes so much easier with access to social media. Websites like Facebook, for example, allow a simple creation of groups for classes and assignments that are simply not possible in everyday situations. In cases like this, it can absolutely be worth to create an account to take advantage. Alternatively, there are other platforms and forums where such conversation can take place, but it’s often up to what the creator of the group has chosen to use – and, more often than not, that’s Facebook. If you are concerned about your private data, considering keeping your profile devoid of other information, just use it to access the study group. Be sure to keep an eye out when it comes to new developments in helpful technology. This is a marketplace and forum which continues to develop alongside the new technology, and it is often the first adopters who manage to pull out ahead of the pack. Remember what we wrote, and keep an eye on what your successful classmates use, and you’ll be well on your way to a much more successful university experience. A cancer vaccine that attacks tumors all over the body is entering human trials. A team at Stanford University – which developed one of the current most widely-used cancer treatments – claims that just one injection into one tumor triggers a full-body defensive response, attacking all other tumors that may have spread. The shot, a combination of two, actives the immune system to fight the cancer. After eliminating even the most distant spread of cancer in mice, the two lead authors are now recruiting lymphoma patients to try the shot in a clinical trial. Since the shot’s application is so localized, the researchers insist it is cost-effective and unlikely to cause adverse side effects often seen in other kinds of immune simulation. ‘When we use these two agents together, we see the elimination of tumors all over the body,’ said lead author Ronald Levy, MD, professor of oncology, whose lab developed Rituximab, a widely-used form of chemotherapy. According to the team, the shot could work for many different types of cancer. While some approaches stimulate the entire immune system, others target certain areas to block the cancer from straying, and others (like the newly-approved CAR T-cell therapy) removed immune cells from the body to genetically-engineer them. All have been hailed a success. But all have caveats, be they arduous to prepare, lengthy to administer, or excruciating in their side effects. ‘All of these immunotherapy advances are changing medical practice,’ Levy said. The method works to reactivate the cancer-specific T cells by injecting microgram (a millionth of a gram) amounts of two agents directly into the tumor site. The first, a short stretch of DNA, works with nearby immune cells to heighten the expression of an activating receptor on the surface of the T cells. The second, an antibody that binds to the receptor, activates the T cells to attack the cancer cells. By injecting it direct into the tumor, it is specifically training T cells which already recognize cancer because they are already inside it. ‘This is a very targeted approach,’ Levy said. For the trial, Levy plans to recruit 15 patients with low-grade lymphoma. If successful, Levy believes the treatment could be useful for many tumor types. Down the line, he believes oncologists could inject both into solid tumors in humans before surgery as a way to prevent recurrence from stray tumors that spread but weren’t detected. If the American political climate has you stressed, you may find yourself imagining a move to Canada. It’s a land where healthcare is free, people are friendly, and Prime Minister Justin Trudeau explains quantum computing just for laughs. But actually becoming a citizen is tough: You need to live in Canada for at least six years, stay on your best behavior, and know a thing or two about the country you’ll soon call home. For those who actually want to head up north, here’s how you move to Canada. Preface: Make sure you’re not already a Canadian citizen. The government outlines several caveats for being a citizen even if you weren’t born there, many of which depend on your parents’ citizenship. Maybe you secretly inherited their status at some point along the way. If you’re not a legal adult, you’ve got an uphill climb ahead of you. Minors need their parent or legal guardian to fill out the application for them, although the parent does not personally need to be a citizen. Canada has a fast-track system for immigration called Express Entry. It’s how skilled workers transition into a role in the country. To become a permanent resident, people can choose between several avenues. They can apply through the province of their choice, go down a special entrepreneur route, get help from a family member who lives in Canada, or go through Quebec, which has special immigration requirements. Permanent residents are entitled to healthcare coverage and can work, study, and travel anywhere in Canada. You just can’t vote, run for office, or hold some jobs with high security clearance. If you’re invited to become a permanent resident, you must confirm your plans to stay Canadian. The government defines permanent residence as living in Canada for at least three years in a five-year period. If you don’t spend that much time within the borders, you could lose your permanent residence status. However, you may still work outside Canada as a public official known as a Crown Servant or live abroad with certain family members who are Crown Servants. Permanent residents don’t always become citizens. The bar for citizenship is higher. If you’re living in Canada, you must have been a permanent resident and physically present in Canada for at least 1,460 days (four 365-day periods) in the six years immediately before the date of your application. Like the residence requirement, you must be able to provide three years’ worth of tax returns in the five-year period leading up to the date of your application. To become a citizen, you need to know just one. You don’t need to be fluent, just conversational enough to make small talk, give directions, use basic grammar, and know your vocab well enough to describe yourself. You’ll send along written documents with your application, but a citizenship officer will make the final call whether your English or French is up to snuff. You take the test if you’re between 18 and 54 years old. Typically, it’s a written test, but the citizenship officer may also ask questions orally. There are no real surprises. Everything you’d need to know can be found here: Discover Canada: The Rights and Responsibilities of Citizenship. Canada is the second-largest country on earth, behind Russia. As such, there is no singular “Canadian climate,” even if people may think it’s just cold most of the time. Depending on how close you live to the British Columbia coast, for example, spring can begin as early as February and summer temperatures can rise into the 90s. So if you’re looking for places to take up permanent residence, research what the weather’s like. You won’t waste money or space buying unnecessary items. Now that you’ve left your home country behind (and if you’re an American, abandoned the circus of presidential elections), embrace what makes Canada unique. 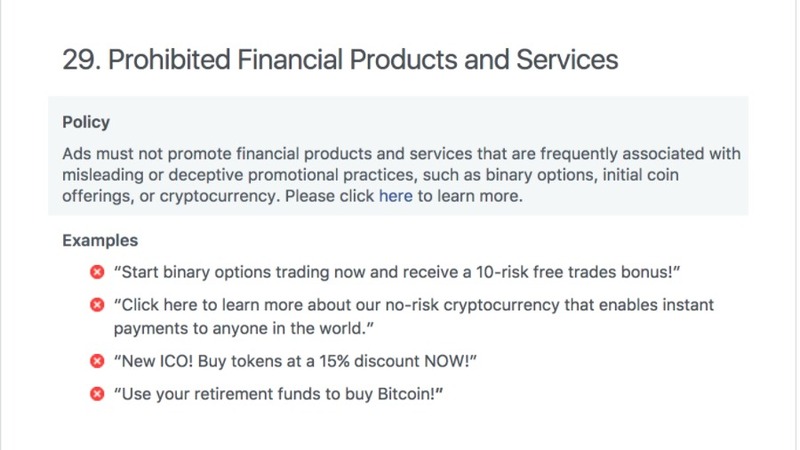 As a part of their refreshed advertising policy, Facebook won’t allow advertisements related to cryptocurrencies, initial coin offerings (ICO), and binary trading, according to a post made by company’s product management director Rob Leathern. “Ads must not promote financial products and services that are frequently associated with misleading or deceptive promotional practices, such as binary options, initial coin offerings, or cryptocurrency. Please click here to learn more,” the new policy reads. Although the names aren’t explicitly mentioned, this will prohibit anyone from promoting cryptocoins like Bitcoin, Ethereum, Monero, Litecoin, etc. Some of the examples include ads providing discounted ICOs, asking users to pay retirement funds in Bitcoin, etc. Leathern agrees that the policy is “intentionally broad” and it might affect legitimate crypto advertisers, but Facebook could make changes in the future as their signals improve. Also, their tracking system might not be fool-proof as it sounds, some ads may manage to slip through their filters. If that happens, Facebook provides users an option to report advertisements. This move from Facebook could “better detect deceptive and misleading advertising practices” and safeguard users from online scammers running false offers and trying to pump hard earned money out of people’s pockets. The new advertising policy applies to the company’s platforms including Facebook, Instagram, and Audience Network. Our body is a temple of God – one that we have to treat with respect and care for. It is a vessel while we are on this earth, and we must make sure that we are gentle with it, and allow it to heal when damaged. Many a times, we are not even aware when there is something wrong with our own body, or we may overlook or ignore the symptoms of diseases that may manifest. At such times, it is advisable that we pay attention to even the smallest of changes in our body, because good health is a privilege we should never take for granted. The liver is one of the most vital organs in the human body, yet a huge portion of the world’s population lives with liver related problems. It is the organ responsible for storing fats, vitamins and sugar, is involved in metabolic processes and purifies the body from harmful toxins that otherwise, could lead to a bunch of diseases. A strong and well-functioning liver is a must for our overall well-being and good health, and it is of utmost importance that we pay attention to this organ and take proper care. While there are many reasons that the liver may suffer from a deteriorating functioning, some of the most common causes include obesity, heavy consumption of alcohol, or eating unhealthy food that may contain toxins that the liver is unable to filter out. A good number of symptoms of toxic-filled liver differ from person to person, but there are some very common symptoms which are seen across all kinds of people regardless of gender, age or ethnicity. These are listed below. If you consume too much fat, it leads to an enlargement of the liver. Consequently, there is an increased pressure against the ribcage and the upper part of the abdomen. A bloated stomach and too much gas are also signs that your liver is filled with toxins. If your liver fails to do its job properly, constantly feeling nauseous and even vomiting could be signs of your organ slowly failing. This is even more common after consuming foods rich in fats. Other regular symptoms that most people go through are frequent dizziness or diarrhoea. If you have a liver problem, your skin and in some cases, eyes will slowly develop a yellowish tint which is indicative of Jaundice. This happens when there is too much Bilirubin content in your blood that your liver cannot filter. Bilirubin is a brownish yellowish pigment found in the bile to aid our food digestion. Skin irritations, rashes and infections are easily developed too. Experiencing unnatural feelings of fatigue easily and constantly even for activities that require little energy could be indicative of liver problems. If you see that your muscles and joints hurt constantly, or you get bruises easily and your legs and feet are swollen, these may be signs of an underperforming liver. Your urine may become a much darker color, while your stool may become lighter or off-white if you have had liver problems for a while. Your health is so important, make sure to treat your body as God’s temple! Please share this story with your friends to help them maintain a healthy lifestyle. It stocks iron: Our liver acts as a warehouse that takes out important vitamins and nutrients from the food we eat and stocks them up. It keeps supplying these nutrients to the body when we need them. It also stores iron and maintains a constant supply of it to the body. Largest glandular organ: Our liver is the largest glandular organ of the human body, its weight is around 1.36 kilograms and is reddish-brown in color. It’s the second largest organ besides skin. Multifunctional: Our liver is like a super computer with a very fast processor. It performs over 200 important functions for the body simultaneously. Some of these important functions include supplying glucose to the brain, combating infections, and storing nutrients. It contains fat: 10% of our liver is made up of fat. If the fat content in the liver goes above 10% its called fatty liver and makes you more likely to get type 2 diabetes. Fatty liver fails at storing glycogen made by glucose from food. Inventor of blood: The liver creates the blood that circulates in our bodies. The importance of the liver lies in the fact that blood cannot be created artificially by humans. The liver starts producing blood before we are born. Without the liver there would be no blood and no life. It regenerates: Our liver has the amazing ability to regenerate itself which makes surgeries like liver transplant possible. When people donate half their liver to someone who needs it, the remaining part of the liver regenerates the donated part. Hormone processor: Our liver is the primary site of hormone breakdown. It breaks down hormones like estrogen and testosterone then converts them into bile which then enters our intestines. Bile is necessary for digestion and emulsifying fats. Protein creator: Our body needs protein to grow and work properly. The food we eat is not sufficient for fulfilling the protein needs of our body therefore the liver produces its own protein. Clotting agent: The enzymes and chemicals required to form blood clots to stop bleeding are secreted by the liver. People with an unhealthy liver bleed easily. Color of stool: Our liver produces bile which is responsible for giving our stool its characteristic brown color. If the color of the stool is not brown it means something is wrong with the liver. Stock of liveliness: Our liver works like a battery. It stores sugar and whenever our body needs it, the liver provides it. Without this stocking of sugar our blood sugar levels fall drastically and we can become very ill, even comatose. Medicine converter: Our body cannot use medicines we take, our liver converts medicine into a form accepted by our bodies. Without the liver medicine would be useless. A simple-to-take test that tells if you have a tumor lurking, and even where it is in your body, is a lot closer to reality—and may cost only $500. The new test, developed at Johns Hopkins University, looks for signs of eight common types of cancer. It requires only a blood sample and may prove inexpensive enough for doctors to give during a routine physical. Although the test isn’t commercially available yet, it will be used to screen 50,000 retirement-age women with no history of cancer as part of a $50 million, five-year study with the Geisinger Health System in Pennsylvania, a spokesperson with the insurer said. The test, detailed today in the journal Science, could be a major advance for “liquid biopsy” technology, which aims to detect cancer in the blood before a person feels sick or notices a lump. That’s useful because early-stage cancer that hasn’t spread can often be cured. Companies have been pouring money into developing liquid biopsies. One startup, Grail Bio, has raised over $1 billion in pursuit of a single blood test for many cancers. For their test, Hopkins researchers looked at blood from 1,005 people with previously diagnosed ovarian, liver, stomach, pancreatic, esophageal, colorectal, lung, or breast cancer. Their test searches for a combination of eight cancer proteins as well as 16 cancer-related genetic mutations. The test was best at finding ovarian cancer, which it detected up to 98 percent of the time. It correctly identified a third of breast cancer cases and about 70 percent of people with pancreatic cancer, which has a particularly grim outlook. The chance of a false alarm was low: only seven of 812 apparently healthy people turned up positive on the test. The researchers also trained a machine-learning algorithm to determine the location of a person’s tumor from the blood clues. The algorithm guessed right 83 percent of the time. “I think we will eventually get to a point where we can detect cancer before it’s otherwise visible,” says Len Lichtenfeld, deputy chief medical officer of the American Cancer Society. He cautions that screening tests can sometimes harm rather than help. That can happen if they set off too many false alarms or if doctors end up treating slow-growing cancers that are not likely to do much harm. Scientists might have accidentally made a huge step forward in the search for a cure for cancer — discovering unexpectedly that a malaria protein could be an effective weapon against the disease. Danish researchers were hunting for a way of protecting pregnant women from malaria, which can cause huge problems because it attacks the placenta. But they found at the same time that armed malaria proteins can attack cancer, too — an approach which could be a step towards curing the disease. Scientists have combined the bit of protein that the malaria vaccine uses to bury into cells it with a toxin — that can then bury into cancer cells and release the toxin itself, killing them off. The scientists have found that in both cases the malaria protein attaches itself to the same carbohydrate. It is the similarities between those two things that the cure could exploit. The carbohydrate ensures that the placenta grows quickly. But the team behind the new findings have detailed how it serves the same function in tumours — and the malaria parasite attaches itself to the cancerous cells in the same way, meaning that it can kill them off. Scientists said that they had been searching for a long time for a way to exploit the similarities between the placenta and the tumour. The process has already been tested in cells and on mice with cancer, with the findings described in a new article for the journal Cancer Cell. Scientists hope that they can begin testing the discovery on humans in the next four years. In the tests on mice, the animals were implanted with three different types of human cancers. It reduced non-Hodgkin’s lymphoma tumours to about a quarter of their size, got rid of prostate cancer entirely in two of six mice and kept alive five out of six mice that had metastatic bone cancer compared to a control group all of which died.